For more than ten years, acclaimed chef Mark Peel has used Campanile's Monday night dinner menus to present his own special takes on popular comfort food dishes like eggplant parmesan and beef goulash. In New Classic Family Dinners, he shares recipes for more than 200 of his best-ever versions of family favorites such as Macaroni and Cheese with Wild Mushrooms, Steak with Anchovy Butter, and Monkfish Osso Bucco. Once you discover these extraordinary versions of ordinary dishes and learn how easy it is to adapt them for a table for two or a crowd of ten, you'll be inspired to make every night a special family-and friends-dinner night. Mark Peel is the owner and executive chef of Campanile, a Los Angeles favorite since 1989. Campanile won the James Beard Outstanding Restaurant Award in 2001 and has been nominated for three other Beard Awards. The restaurant has also won the "Nation's Restaurant News" Fine Dining Award, the DiRoNA Distinguished Restaurant of North America Award, and the International Star Diamond Award for Outstanding Hospitality. 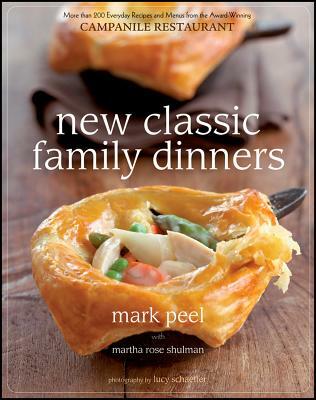 Peel lives in Los Angeles with his family.Martha Rose Shulman is the award-winning author of more than 25 cookbooks, including Entertaining Light and Mediterranean Harvest. A regular contributor to "Bon Appetit," "Food & Wine," "Saveur," "Cooking Light," and the "New York Times," she lives in Los Angeles.